As soon as you enter Level 1, exit. Then, go back into Level 1. You will notice that the northern door is now unlocked. When your health gauge is low, visit a lake of a Great Fairy to restore your life. When you approach the lake, your health will slowly fill. While your health is being restored, press start to enter the item selection menu, and your health will continue to fill. Using a controller in port 2, press Up + A to return to the save menu. Select SAVE, and load your character’s file. Once loaded, instead of remaining at the default of 3 filled heart containers, Link will have his health fully restored at the start. Although the video shows gameplay on the Wii Virutal Console version of the game, this glitch is possible on the original version as well as documented. To perform this glitch, Link must go one screen to the left from the start and walk along the rocks on the top of the screen. Once Link gets to the corner, walk to the right while avoiding the break in the wall and turn to go straight up. If done correct, Link will be walking on the top and appearing to be walking on the HUD. To end the glitch, walk down from the rocks. Sometimes, when exiting the Level 4 entrance screen, the Red Octorok will spawn on the dock, so as you come down from your raft, he will hit you, causing you to sail back to the top without you being able to counter it. He will appear there every time you try to go back. You will either have to use the whistle if you have it, or go deep enough in the dungeon that it will reset the Octorok spawn, then come back out. To perform this glitch, Link must walk towards a door, and just as he touches the door, attack with the sword. He should now attack and walk through the door at the same time. This is completely cosmetic and will not effect gameplay at all. Unconfirmed: Using the Red Candle, and a turbo button controller, you are able to shoot the Red Candle immediately after entering the room, allowing Link to move around before he is supposed to. Make sure to hold the “B” button down as soon as your start the transition in between rooms. Now that you can move around before you are supposed to, you can switch to the Silver Arrow to defeat Gannon before the battle even starts. Although the video shows the Second Quest , the author claims it is possible in the First Quest as well. There is questions to whether or not this is possible due to many not being able to confirm it based on YouTube comments. By blowing the whistle when fighting Gleeok (the Level 4 boss), leaving the room, then entering the room again, the boss will be gone or killed. Questions & Theories: Why would this not be possible on the First Quest, has anybody tried? Does this work with any other bosses or rooms? Missing Information: According to the report, you are able to turn your screen grey if you place a bomb on the Gleeok (Level 4 boss) room, then play the whistle before the bomb explodes, the screen will stay grey. Questions & Theories: Does the screen turn grey permanently? Why does this only work on the Gleeok screen? Is it possible to reproduce on other bosses or rooms? When you are in a dark room that calls for use of a candle, place a bomb first. Then, quickly switch to the blue candle, then fire the candle onto the bomb. If done correctly, the room will be in grey. Unknown Causes: For unknown reasons, the Petra enemy shown in the video below started using strange rotation patterns, which seems to return to normal after some time, before entering the weird rotation once again. Unknown Causes: Similar to the glitch where Link can appear at the top of the screen upon rare circumstances, once in a while it is possible for a blue Wizzrobe to go through a doorawy at the top of the screen and end up at the top, where the map and life meter are located. If this happens, just leave the room after killing all other enemies, then return to find the Wizzrobe where it belongs. Note: If there were any pink Wizzrobes in the room, this Wizzrobe may transform into a pink one while you’re out of the room. To perform this glitch, Link must find any dungeon that has doors on both the north and south walls in the Second Quest. In Level 2, the wall that borders the north side of the Whistle room will suffice. Start on the north side of the wall and walk south through it, then immediately turn north and go through it again. Once Link finishes going through it, part of him will still be in the wall. Push to the south and he’ll enter the wall as if it were an open doorway. Walk through the wall and Link will come out on the other side and move a full tile away from the wall, disregarding anything in the way. 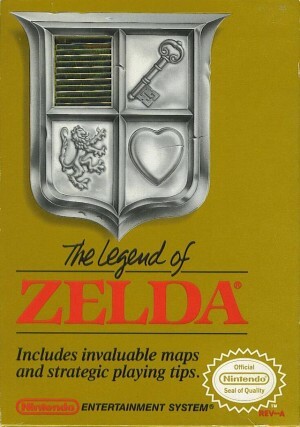 As shown in the video below, the author shows a saved game with no hearts, and upon playing it, Link seems to only have one heart and no items besides the sword. Some other oddities are shown in the video such as getting another heart when being healed by a Fairy Fountain. This is most likely due to a corrupt save game caused by battery age, resetting/turning off power on save, or a variety of other corruption possibilities. Do not attempt this if you care about your game data. In order to do this, all you need is a NES Advantage controller. Turn on the game and then unplug any controller that you have in slot #1. Now plug in your NES Advantage into slot #1. The game will freeze at this point. Once you reset, you’ll find that your data in the first save slot will be erased! If you wish to switch to a NES Advantage in the middle of a game and avoid data loss, do the following: First, unplug whatever controller you have in slot #1. Before you plug in the NES Advantage, move the switch on the controller over to controller 2. Now you can plug the first cord into slot #1 safely, but just be sure that it’s the first cord and not the second! Once it is in safely, you can move the switch on the controller back to controller 1. The hitbox/collision mask when swinging the wand is disjointed. Whenever you swing in any direction, not only can the Wand hit behind you when you retract it, but when swinging down, left, or right, it hits 1 grid square above you. As demonstrated here, this glitch can be an invaluable asset to any swordless quester. This works best with stairway entrances in the Overworld, but normal caves (with the fancy entrance cinema) can also be used. After making a large transaction (such as buying the Blue Ring or uncovering a 100-Rupee secret), leave the cave, then either re-enter that cave or go into another one. The only requirement is that the Rupee count is still increasing/decreasing as you enter. About 50% of the time (does not work on all occasions), the Overworld music will continue to play even while you’re indoors! If you enter a Dungeon this way, the Overworld music will play until the dungeon is fully loaded, after which the dungeon music takes over. While standing in or around a door, sometimes damaging spike blocks or projectiles will not cause any damage. There seems to be a field around and in the door that will make things not cause damage to you, such as Wizzrobe wand attacks; however, if an enemy walks into the door frame, they will damage you as per normal. The video below showcases this happening with spike blocks. To do this, you must be in the Second Quest and have finished the first four dungeons. Blow the whistle so that you are taken to the location where Level 5 used to be. Remember, Whistle drop-off locations remain at the First Quest locations, and where you can go is dependant on which Triforce pieces you have not received, not the on screen level number. When you arrive, the Fairy will start the healing process BEFORE Link appears, and Link will actually be able to move around, even leave the fountain. Better yet, your Life Meter continues to go up even though the fountain isn’t onscreen any longer! Any damage that Link receives will automatically be recovered while his hearts are filling. There seems to be a hidden push block located in Level 9 which can be pushed after placing a bomb down. This is most likely a remnant of the development process and left in the game inadvertently. To perform this glitch, Link must approach the Hungry Goriya blocking his path in certain dungeons. After feeding the Goriya the Food and the Goriya fades after the “secret found” jingle plays, go to the subscreen to end the game. Select continue on the options list and the game will restart with Link at the dungeon entrance. The Food will still be in Link’s possession, but the Goriya will be gone when he returns to its room. Well look at this? Another gaming site project? I must have all the time in the world! (sarcasm alert) On a serious note, this site hopes to be an extremely comprehensive source and collaboration project for documenting video game glitches, bugs and other errors. Filled with info, sources, pictures and videos. My nes is eff’d up and it turns every white person in my game….BLACK!!! I’m not kidding. Link is also black. I LOVE LEGEND OF ZELDA, AND POKEMON! BUT ZELDA IS BETTER! anyone ever have the level 6 dungeon glitch? I had it when I was a kid on my NES, anytime I walked in a certain room my game froze unless I had a certain item. I forget if this is the game in general or a glitch. I haven’t been able to dig up any information on it. I don’t recall that happening to me either when I last played it. Let me know if you have any more info on it. I just got stuck in a room in Level 6. It was a room where the exit door doesn’t open until all enemies are killed. I collected a stopclock and killed all enemies. All that is left is one of those electric balls that you cannot kill. My stopclock will not expire and the door will not open. @Shinobi – Sounds like you were in a room with Wall Masters and got the Clock. If that is the case, the Wall Masters were also frozen in the walls before appearing, and since this is a room where all enemies need to be killed before the shutters open, you are soft-locked. It is rare, but can happen. Thanks for confirming. I have marked it confirmed by you. Do you have any additional information on this glitch? Why does this work? Will it work on other bosses? Thanks! i can. i have all the requirements. i would prefer to do it on 3ds, but i can on the nes if you want. I am very interested in that Ganon Quick Kill. It looks like a frame-perfect action. I am very surprised that it hasn’t been debunked/verified at this point, being the original video is almost 6 years old now. The community at large is under the impression Ganon cannot be killed without sword. However, Ganon does not enter Phase 1 in this video… and it would be interesting to find out why. And could a wand bolt also cause this glitch to occur? First things first… I will try to duplicate it. I know this isn’t really related to the glitches, but has anyone ever had their save file mysteriously vanish. I have always killed myself off and saved the game before turning it off and even turn off the console using the reset/power method. Somehow, upon returning to play my game, my file has completely erased itself. It was in the 2nd file slot of three; the third empty and the first containing my gf’s file which held no progress, but somehow still existed in tact. I find it odd that only my file would delete and not the file in the first position (especially if this was an issue related to the battery in the cartridge). I realize there’s no getting my file back so perhaps this is a lost cause, but if anyone out there happens to know of what may have caused this I would greatly appreciate your input so that it doesn’t occur again. Also, forgot to mention that I play the game on the original NES console. A quick question, I’ve been playing The Ultimate NES Remix for the 3DS. In the original The Legend of Zelda game, I noticed in the dungeon levels where there’s a diamond shape of bricks and the room is filled with Darknuts, normally you have to kill all the Darknuts and then you can move a hidden block in the diamond shape. It’ll make staircases appear in the center of the diamond shape. You go down the stairs and usually there’s a special item, like a raft or something. However, in The Ultimate NES Remix of The Legend of Zelda, people are some how walking through the brick on the right of the diamond shape without killing anyone. Somehow they do some fancy button work it looks like, like stabbing once forward, and then pushing down on the controller and over or something. I can’t figure it out. They just hop right over to brick and they’re inside the diamond. Stairs appear and away they go. I wanted to know if this is unique to just the 3DS Remix game or if it works with the original game as well. I believe it works with the original game. I’ve seen other glitches from various games that seem to work. Does anyone know how it’s done? I can post a video of a player on t he scoreboard who’s successfully pulled it off if anyone wants. Thanks. soflock: Go to the down left corner of the map and use the screenscroll giltch when you are standing just next to a wall. gameSniped gameSniped strives to showcase the most obscure, interesting and other rare items that eBay has to offer. Unseen64 A blog dedicated to showcasing beta, unreleased, cancelled and unseen video games with plenty of pictures and videos. Center for Glitch Studies Another now defunct (or never updated) glitch archive site. Plenty of good documentation here. David Wonn's Unique Video Game Glitches! A vast repository of knowledge on retro game glitches (up to Nintendo 64). Flying Omelette (Glitches Page) This “Documentation of Game Glitches” page on the Flying Omelette catalogs a lot of retro game glitches. RedSouthCity (YouTube) Creators of the YouTube series “Glitchbusters” as well as other video game collecting and random retro gameplay videos. System Crash Glitch Page A now defunct glitch site that has quite a bit of glitch documentation on popular games. Copyright Glitch Gamer. All Rights Reserved.